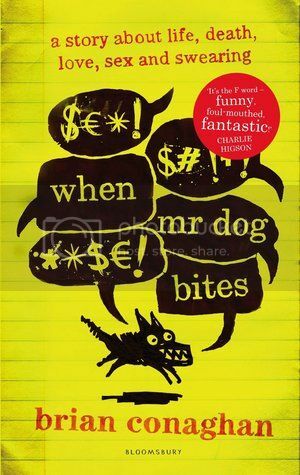 When Mr Dog Bites by Brian Conaghan (ARC) - Meet the a-mayonnaise-ing Dylan Mint. He's sixteen and he's got Tourette's. His life is a constant fight to keep the bad stuff in - the words that explode out of his mouth, the tics, the growling, howling dog that tries to escape whenever he gets stressed. Plus there's his mum, who buys him cheapo clothes from Primark and keeps crying. And his dad, who's away in the army and could get wiped out by a sniper any minute. After reading an article on the Telegraph's website about When Mr Dog Bites by Brian Conaghan and whether some books should come with PG warnings, I've been really interested to read this book. To be honest, the article put me off in one sense - I'm not really a huge fan of swearing in books (YA or adult), it's my personal preferance - and yet, I was wondering just how sweary it could be to have such an article written about it. And I'm so happy to say I absolutely loved it! I think the synopsis above gives a pretty accurate description of the book, and there's not much I could add, so I won't write my own. Dylan has Tourette's Syndrome and seems to have learning difficulties/has special needs too. From my research, I can't find anything that means Tourette's sufferers have learning difficulties as well, but Conaghan did work as a teacher at a special needs school, and that was partly where he was inspired to write When Mr Dog Bites, as well as his own experience with Tourette's. I don't want to talk much about the story itself, because it's a beautiful one of friendship and family, and just being yourself, and I feel it's one readers should discover themselves - but it is amazing! Instead I'm going to talk about the how the novel presented Tourette's. I learned a huge amount about Tourette's from this novel, despite it not being so focused on the syndrome itself. Dylan would talk about it every now and again, but mostly it was a case of being shown rather than told, which was awesome. Before reading the book, I thought having Tourette's simply meant you shouted out swear words a lot, uncontrollably. But it's more than that, it's involuntary tics and noises too. As said in the synopsis, Dylan growls and howls as well, and that's why he calls his Tourette's Mr Dog. It was eye-opening to see how hard it is to control, and that even trying to force yourself not to tic or swear or growl, the worse it gets when you lose control. I found it very poignant when Dylan is trying to talk to a girl and ask her out, but because he's nervous, his Tourette's kicks in, and he ends up insulting her. It's heart breaking to see him try so hard, yet unable to control what comes out of his mouth. Saying that, it's not as sweary as the article above makes out. Dylan's Mr Dog only really bites in a major way when he's really stressed or nervous. There will be other things, but it doesn't get as bad. So althoughth, yes, there's swearing, and even words I really don't like, there's no eff-ing and blinding on every single page. You're not overwhelmed by the language. Yes, sure, some of the other characters in the book swear, but most of the swearing in this book comes from Dylan, and I simply cannot see how you can talk negatively about a book for this when real people suffer with this condition. It's realistic, and to say it shouldn't be that "a YA book has to be full of obscenities in order to be bold and challenging" in regards to a book about a boy with Tourette's... well, isn't that like saying we shouldn't have YA books with characters who have Tourette's? I find that really shocking. Everyone should be represented. As I said, Dylan also has special needs. It's not gone into what special needs he has, but you can tell from his voice and his interests and the way he doesn't completely grasp or understand certain things that he has some learning difficulties. This makes him endearing - not in the sense that I pity him or anything like that, but in the sense that he has an innocence about him, and so he sees things differently. His view of the world is though-provoking, and real sweet. He goes to a special school, and although there are other students there for their own reasons - like Amir, Dylan's best mate, who has Autism, and Michelle Malloy, the girl Dylan fancies, who has Oppositional Defiant Disorder - the story never really goes into them in much detail. It's not a story about conditions, it's a story about people. When Mr Dog Bites is truly a fantastic story, and such a beautiful one! I really would recommend this to everyone, I loved it! Thank you to Bloomsbury via Foyles for the ARC. What a great review! I find it so confusing how some people say YA books shouldn't talk about certain things that teens and young adults actually go through. If it's in some YA people's lives then it's appropriate for a YA book, and a lot of teens and young adults have to deal with some very rough things. You put that quite eloquently in your review.